I was at Costco yesterday to return some fuzzy (moldy) avocados and I wanted to pick up some hummus. 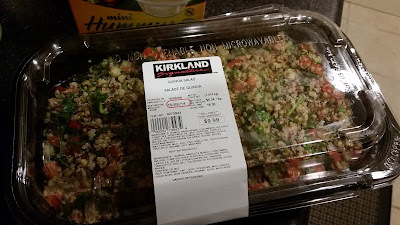 On my way to the coolers I walked past their pre-mixed salads and saw this quinoa salad. I know it's more cost efficient to make it myself but I wanted something quick. 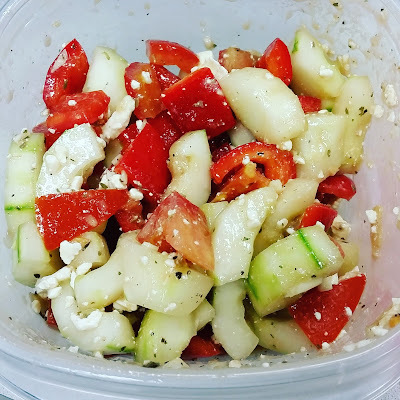 Even though I'm eating more carbs I've been aiming to eat more vegetables. It's amazing how good my body feels when I eat more veg. They're nutrient dense and it's hard to go over calories if you're eating mostly vegetables since they are low in calories.